LOCALLY OWNED ULTRA-LOW MILEAGE HARD TOP 4X4 -- NUMEROUS UPGRADES -- CUSTOM WHEELS -- CLEAN CARFAX! LOCALLY OWNED ULTRA-LOW MILEAGE HARD TOP 4X4 -- NUMEROUS UPGRADES -- CUSTOM WHEELS -- CLEAN CARFAX! 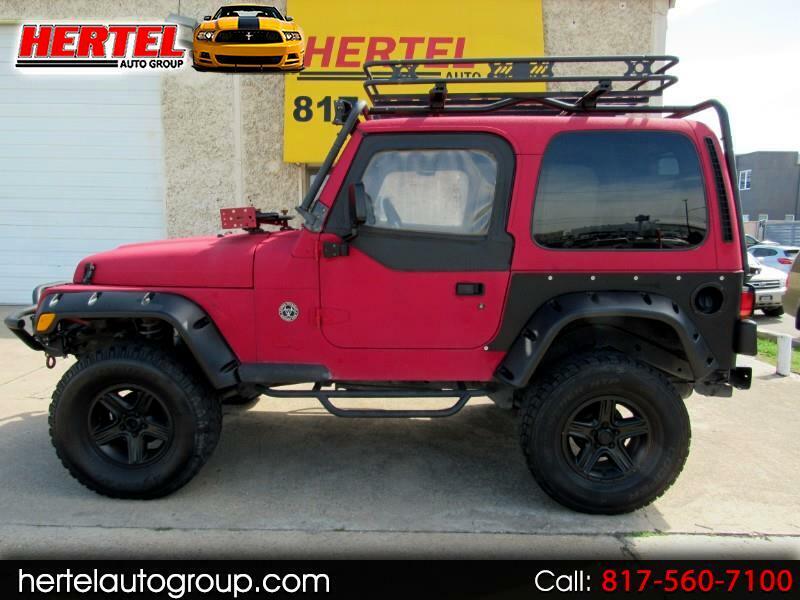 Hertel Auto Group is pleased to offer this amazingly low mileage, 1-of-a-kind, go-anywhere, ready-for-the-Zombie-Apocalypse 2002 Jeep Wrangler X 4WD SUV for sale in Fort Worth Texas. Bought brand new out of Dallas Texas in February of 2002, this head-turning Jeep has spent its entire life right here in the North Texas area. Whether you're a previous Jeep Owner or a Newbie to the experience of owning one of these SUVs with a cult following, this is definitely the Jeep 4x4 to consider. This very good example of a ready-to-go-anywhere Jeep has been well-cared for and enjoyed throughout its years of ownership. On the road, this Jeep's legendary and durable 4.0-Liter 6-Cylinder engine produces 190 Horsepower and 235 ft lbs of torque while still delivering almost 20 mpg on the highway. Mechanically, this good-looking Jeep Wrangler starts, runs, drives, shifts and performs exactly like you'd expect it to. An aftermarket AirRaid Cold Air Intake (CAI) gives it a little horsepower boost as well. All four Cooper Discoverer LT285/75R16 tires mounted on Blackout 16" Rims are in good to very good condition. On the outside, this rust-free Jeep sports an uber-cool, cult-classic inspired Red Rhino-Lined Exterior that is complimented by a Tan Cloth interior. A bevy of exterior goodies including a Winch (with a remote and it works); Roof Rack; Light Bar; Fender Flares; Step Bars and more add even more to its cool factor. Its Hard Top exterior with Soft Upper Door Panels looks great! Inside, the solid and utilitarian condition of this smoke-free Jeep carries over with front and rear cloth seats; Cold A/C and an upgraded Alpine CD Audio System. As with any pre-owned vehicle, it does have the usual amount of cosmetic imperfections that are inherent to a vehicle of this age and mileage. We invite you to view all of the pictures on our Web site and determine for yourself if it meets your expectations for a vehicle of this age and price. If it does, we welcome you to visit our location at 2843 White Settlement Road in Fort Worth Texas 76107 for a viewing and test-drive of this nice and clean '02 Jeep Wrangler X 4x4 SUV. Like all the Jeeps we get in, its priced fairly and it won't last long. Don't let this one pass you by!